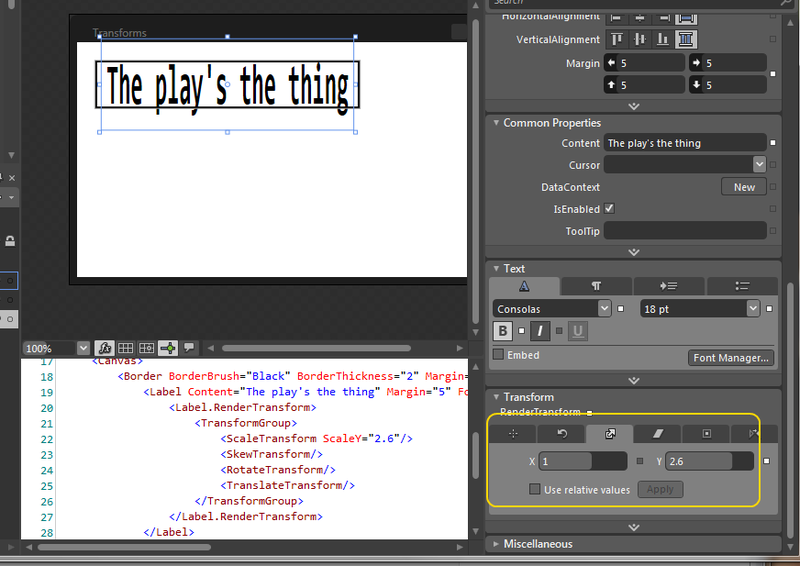 When you work in Blend, you can move windows around within Blend, or move them outside of the main Blend GUI. Blend restores the last known arrangements of windows when you start up again. You can also save a particular arrangement of windows, so that you can later restore the same arrangement. These saved configurations are known as workspaces. To save your current window configuration, select Save as New Workspace, under the Window menu. You’ll be asked to give the new workspace a name. After creating a new workspace, you can switch between it and other workspaces by selecting a workspace under the Workspaces submenu in the Window menu. You’ll notice that there are two preexisting workspaces: Design and Animation. 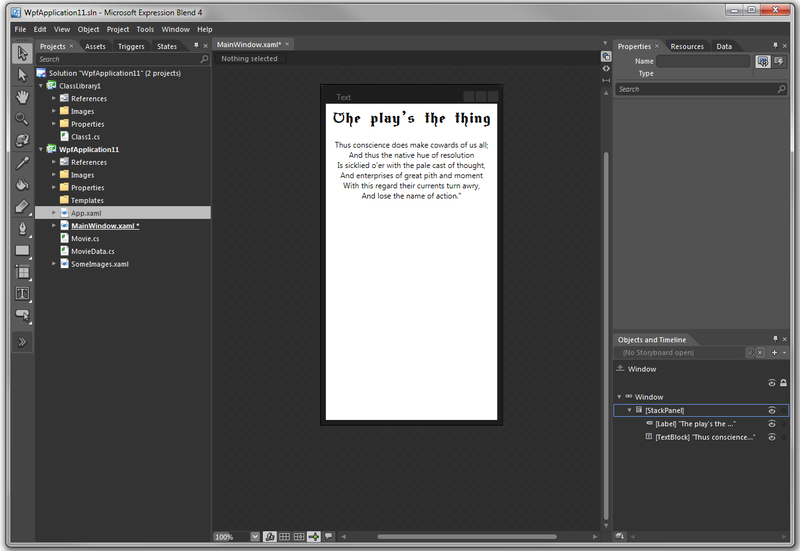 Design is the default workspace that shows up when you first start Blend. 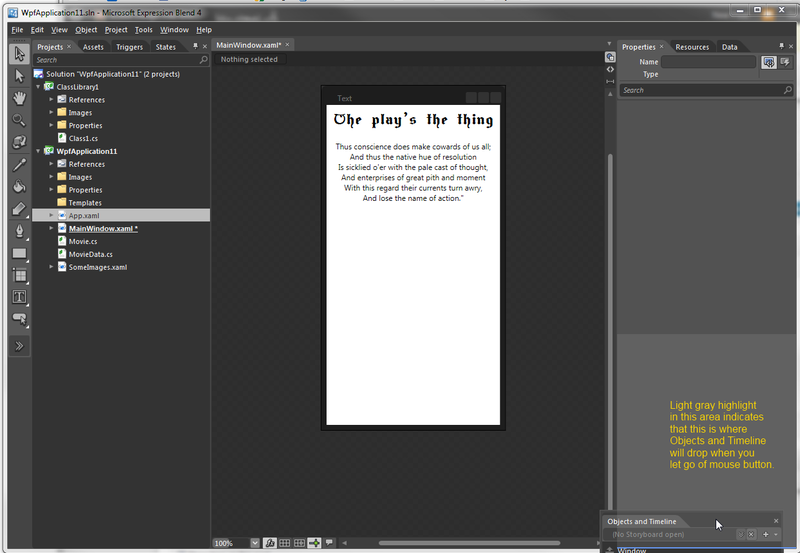 Animation puts the Objects and Timeline window below the artboard so that storyboard timelines can be wider. 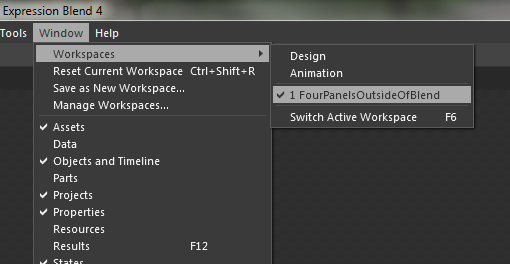 While working in Blend, there are a number of different windows (panels) that you work with. 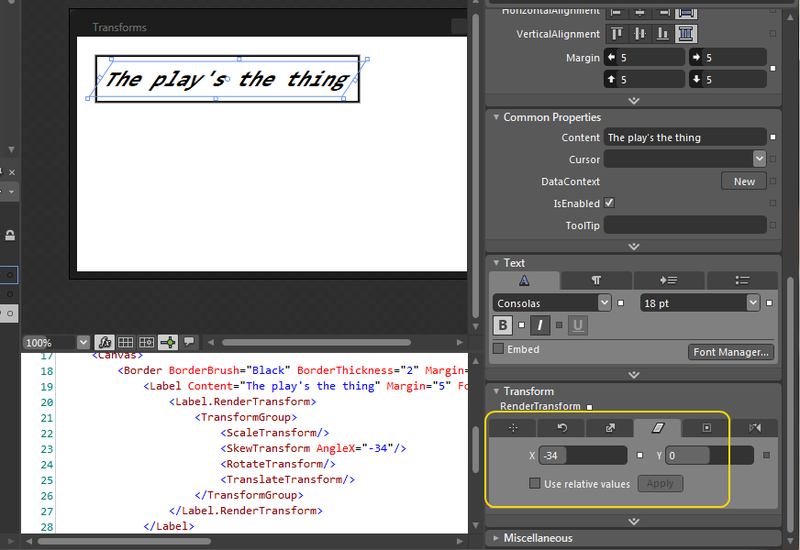 The image below shows the default configuration, with the Tools panel on the far left, and another panel with Projects/Assets/Triggers/States tabs, etc. 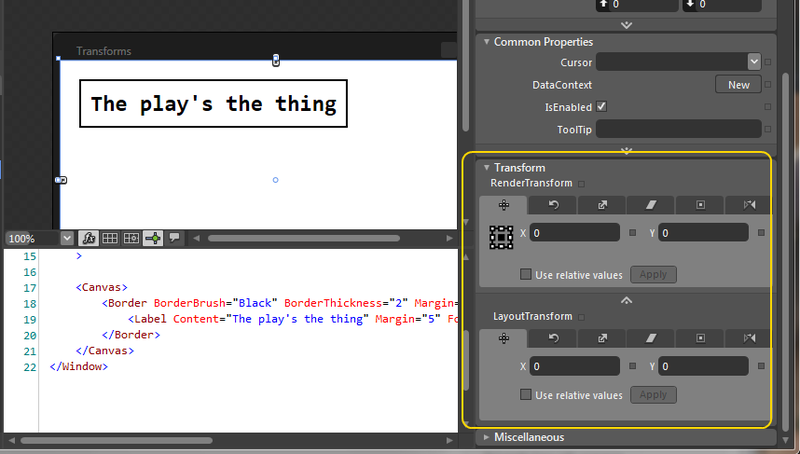 You can move any of these windows around within Blend, except for the artboard (the area in the center of the screen that contains the Design and XAML views. The artboard will take up all remaining space not used by other windows. To move a window, left-click and drag it to the desired location. 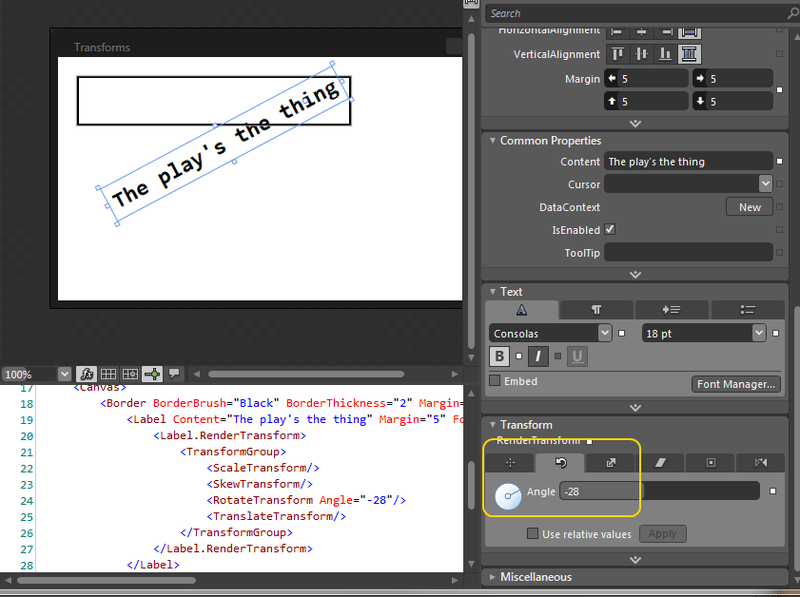 For example, we can move the panel containing the Objects and Timeline tab, so that it sits below the panel containing the Properties tab. 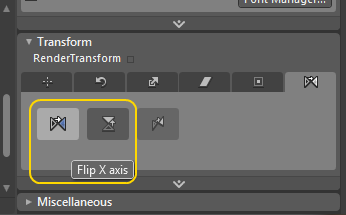 You can also left-click and drag on a particular tab, to move it to another panel. (E.g. 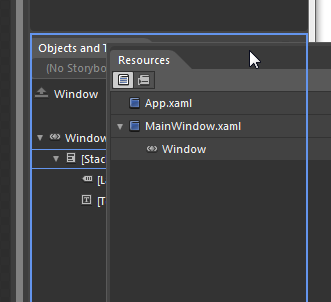 Move Resources tab down next to Objects and Timeline). 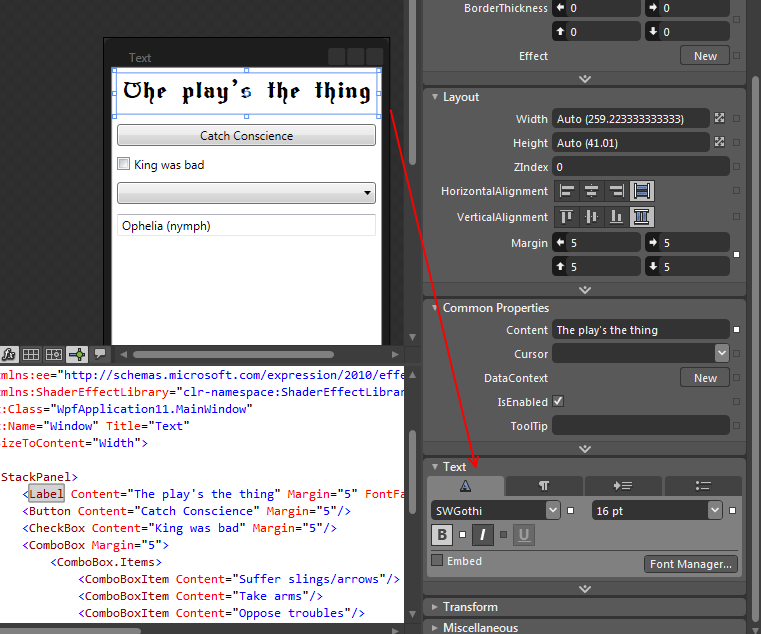 You can set text-related properties for a control using the fields in the Text area of the Properties panel. 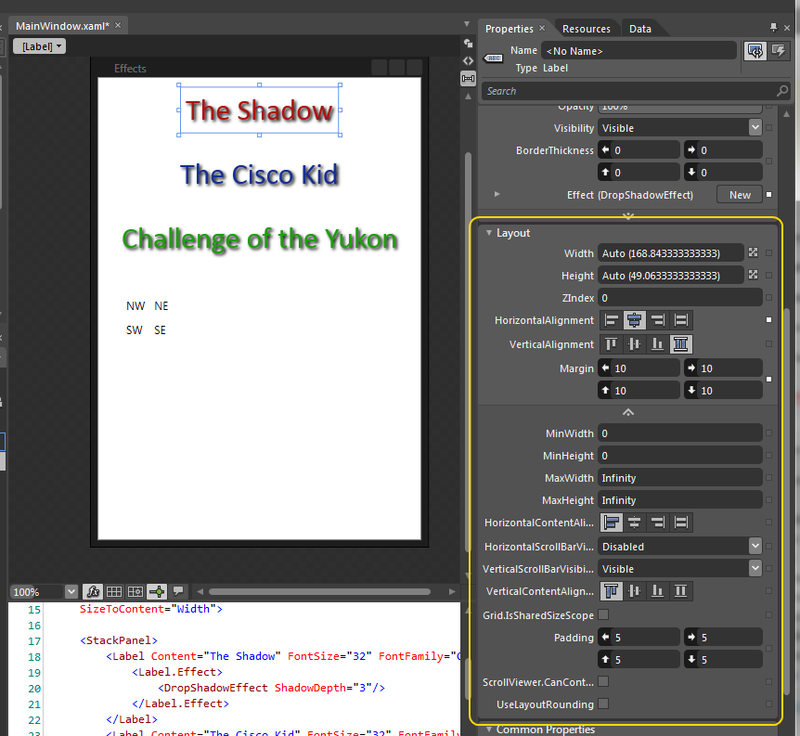 For example, you can set the font family, font style and font size for a Label control. Or you can click on the tab with the paragraph mark to see properties relating to formatting, where we can set a TextAlignment property for centering a block of text. 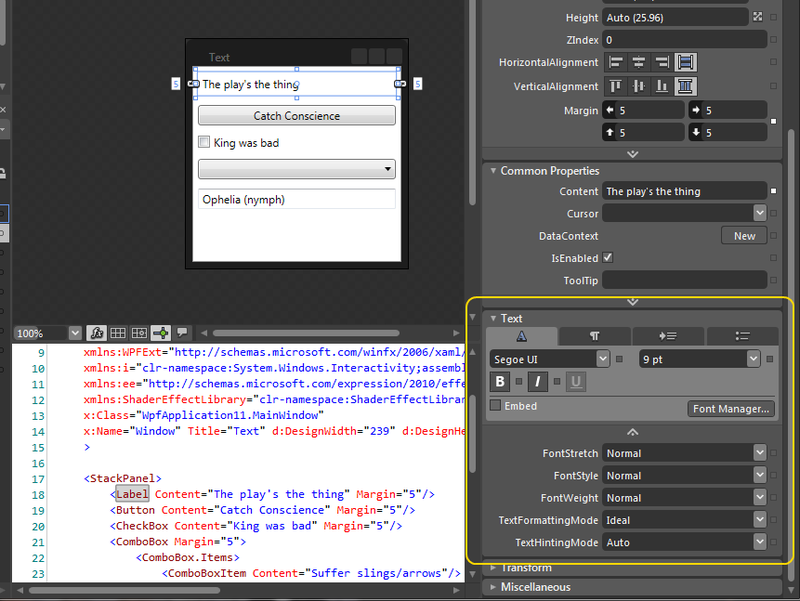 The Layout are of the Properties panel will let you set properties that are related to layout of a control. 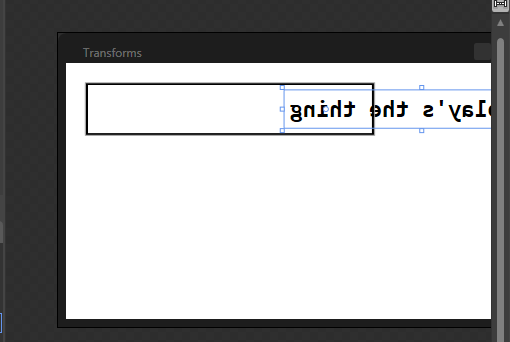 This includes things like margins, alignment, height and width and padding. 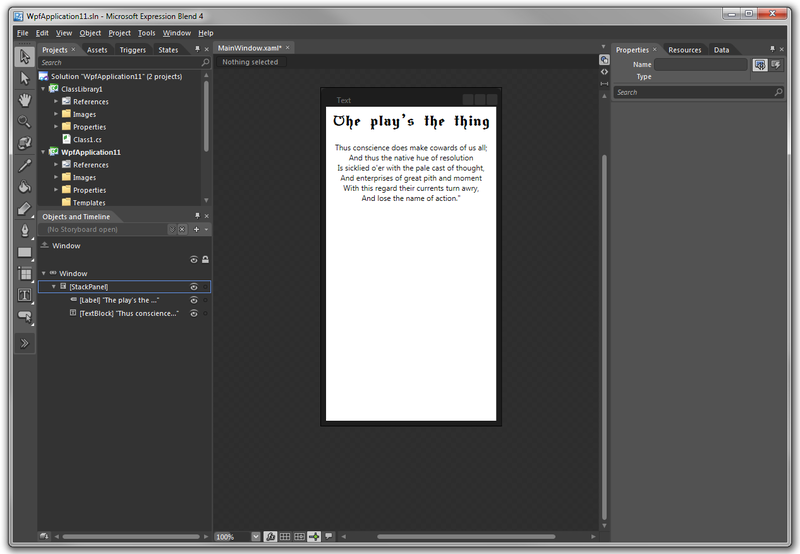 By default, only some of the full set of layout properties are shown. 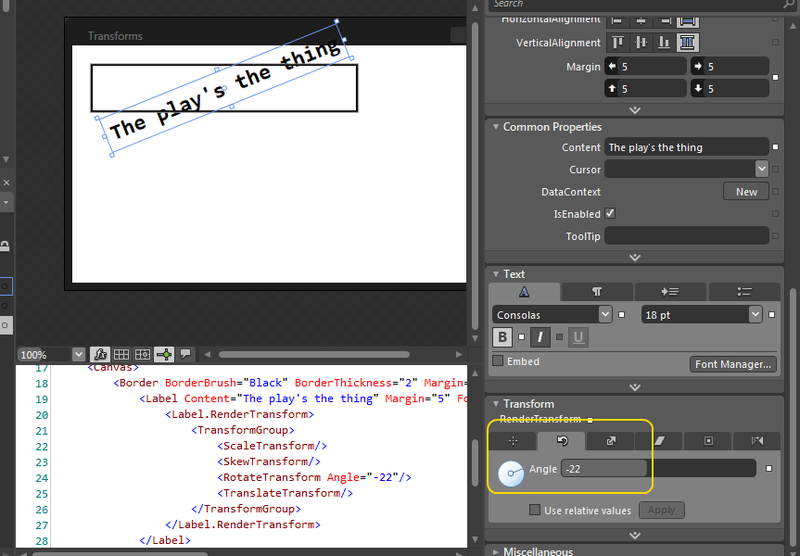 You can, however, click on the downard facing arrow icon to see more advanced properties. 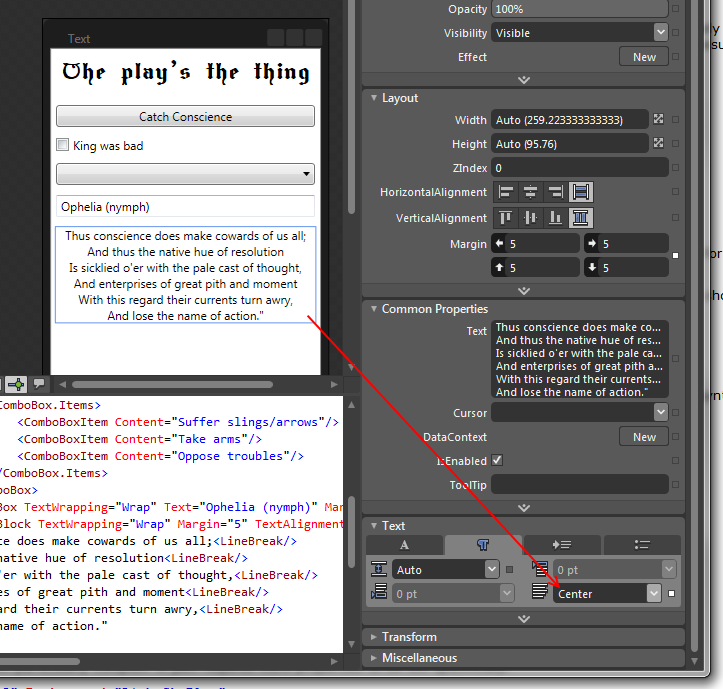 Properties shown can depend on panel that the control is hosted in. 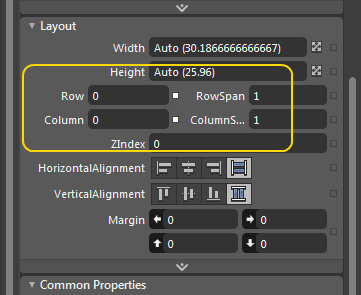 For example, a control hosted within a Grid will include Row, Column, RowSpan and ColumnSpan properties. 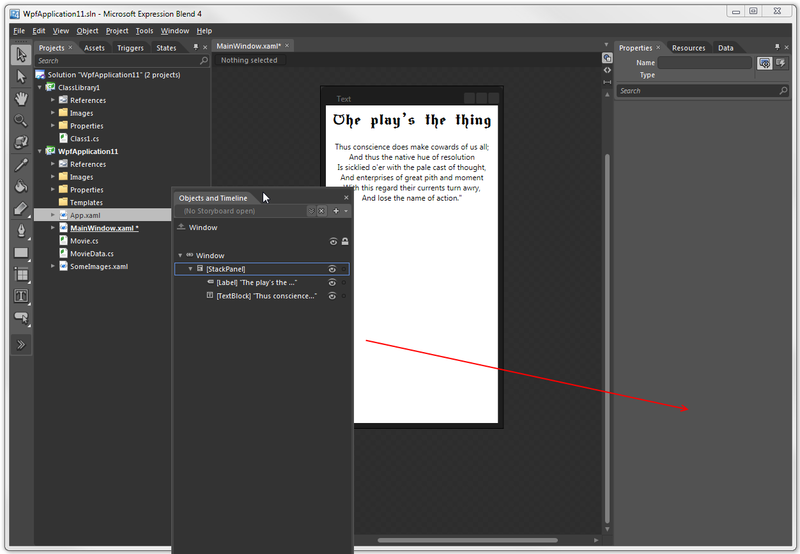 Like other elements, you can set various properties of an effect in Blend using the Properties panel. 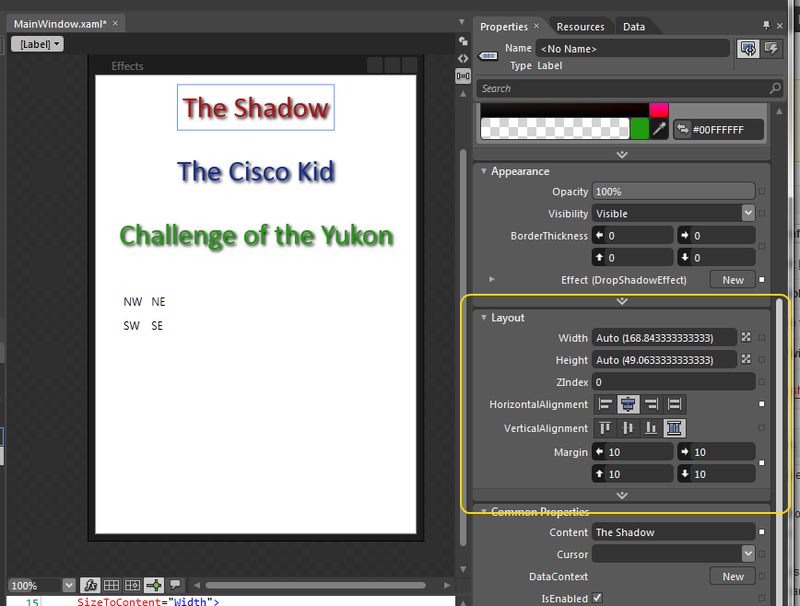 In the example below, we’ve added a DropShadowEffect to a Label. 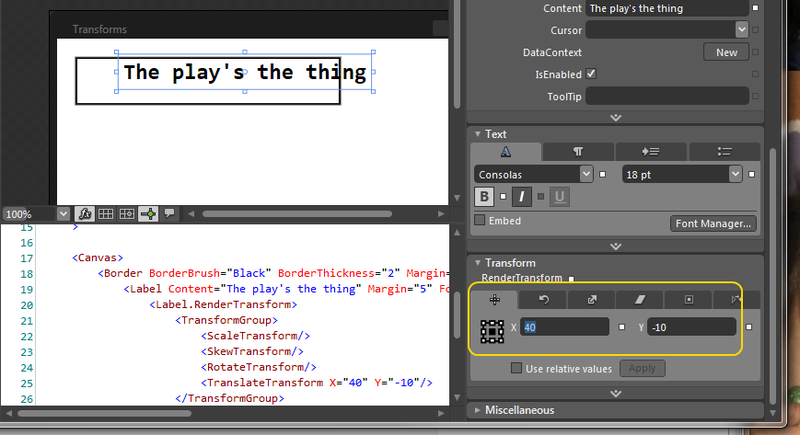 If you select the effect in the XAML editor or the Objects and Timeline panel, you’ll see several properties that we can set for this effect. 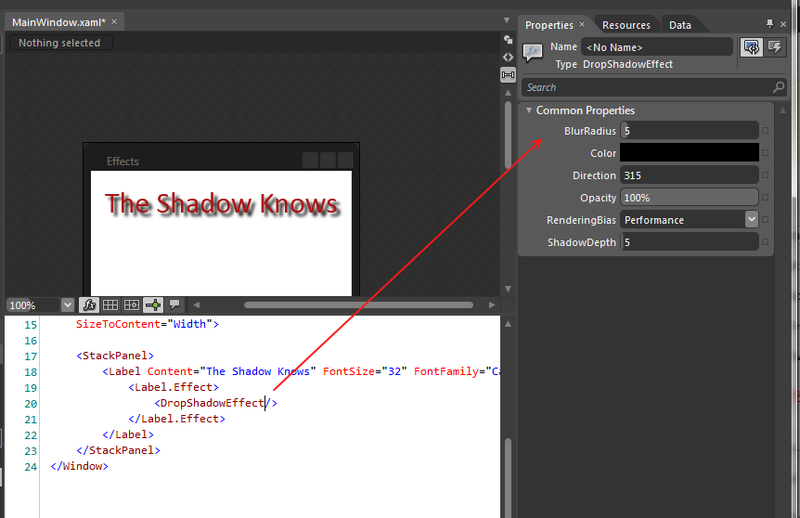 For example, we can increase the ShadowDepth, so that the shadow appears further away from the Label.